Guide written by Wolfnipplechips that could not have been completed without the contributions of many people. This article MAY NOT be used or copied without the permission of wolfnipplechips AND everybody else who had a part in it (Curlz, Nat, Wodesorel, etc). 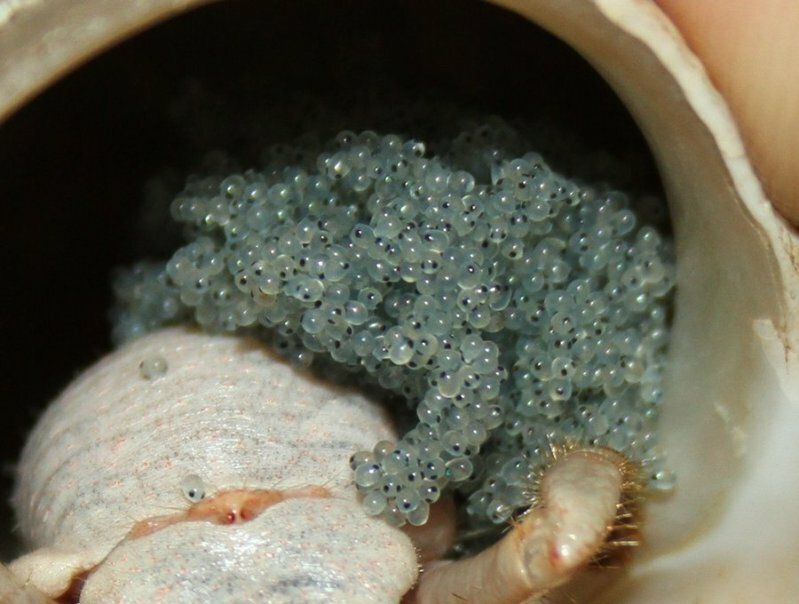 Hey all you potential hermit crab breeders! Here is a guide outlining different breeding methods, and giving a photo time line of the breeding process. 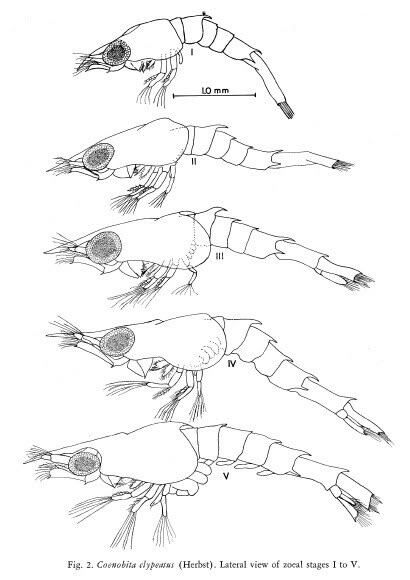 This is to help you set up for and carry out larval rearing, not to instruct you how to make your hermit crabs breed. 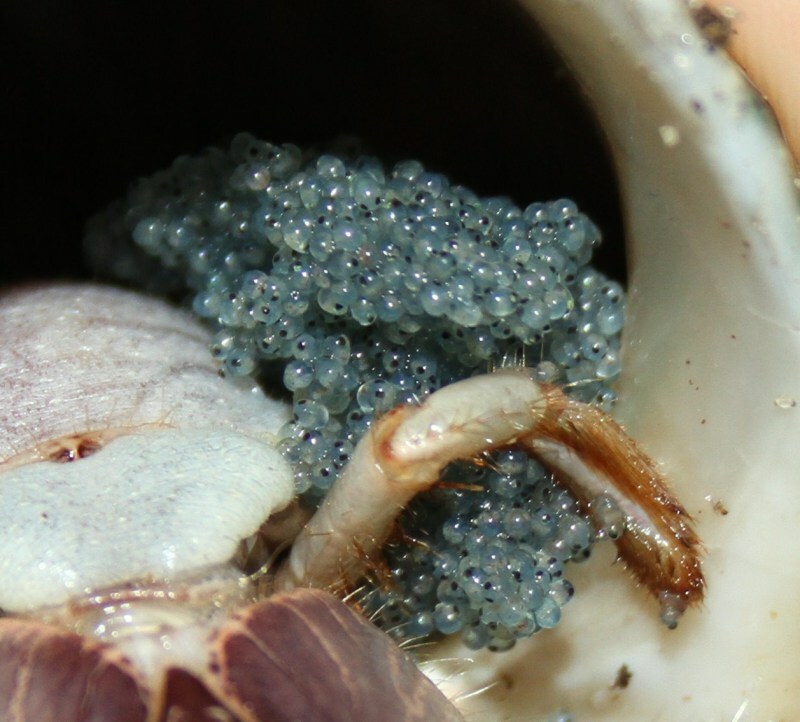 Note that egg/larvae colors and dates will vary from crab to crab, and especially species to species. 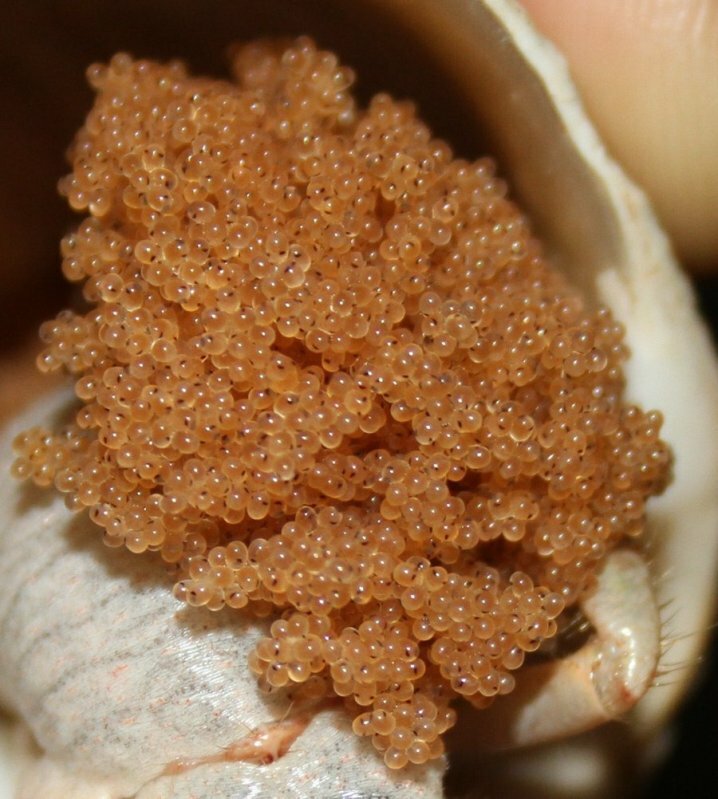 The following eggs and larvae are mostly from Coenobita clypeatus. 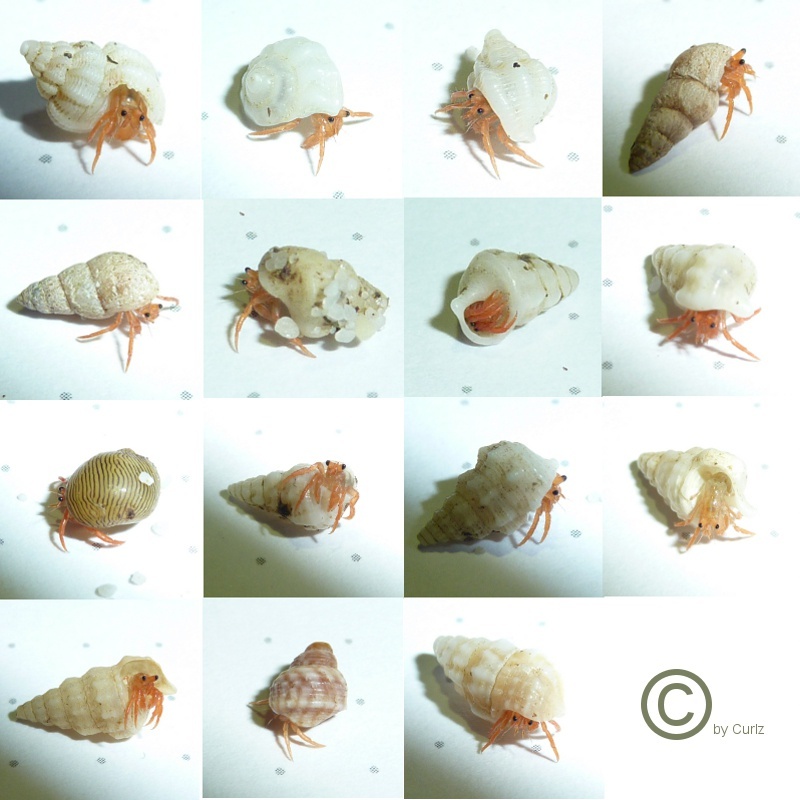 But thanks to the efforts and kindness of Curlz and Nat_addicted to HC's, we have photos of the babies of different species as they take shells and move onto land. It all starts with pre-copulatory guarding. 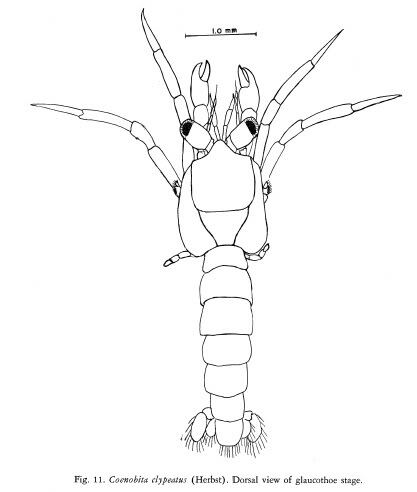 This usually happens in early-middle summer for C. clypeatus. 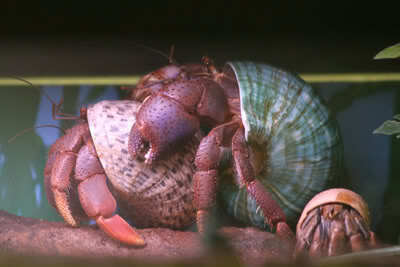 The male will guard the female usually by gripping her shell. He will vigorously fight off any male that tires to challenge him, or even happens to walk past him. Please note that the larvae will develop at different rates do not take the days as a golden standard. 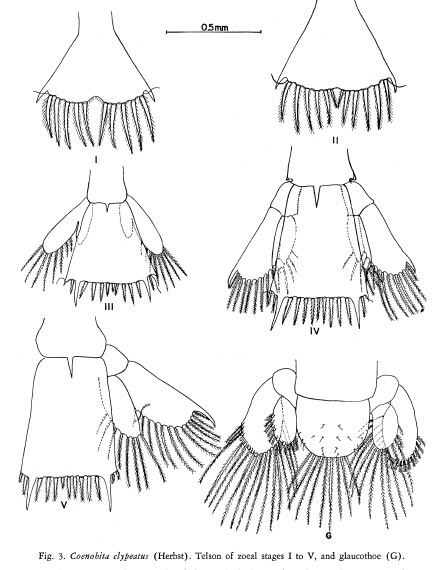 They generally stay in each stage 4-6 days before molting. 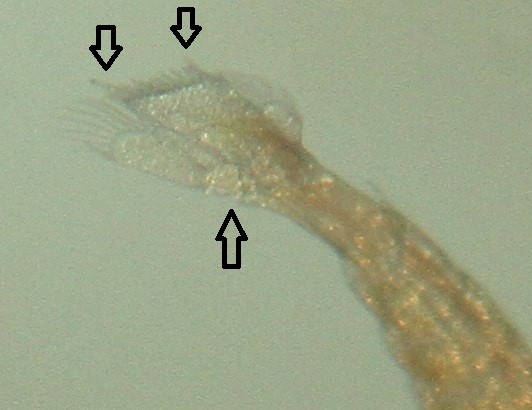 Some species have abbreviated larval stages that go through less stages, but Coenobita clypeatus has 5 stages before glaucothoe. 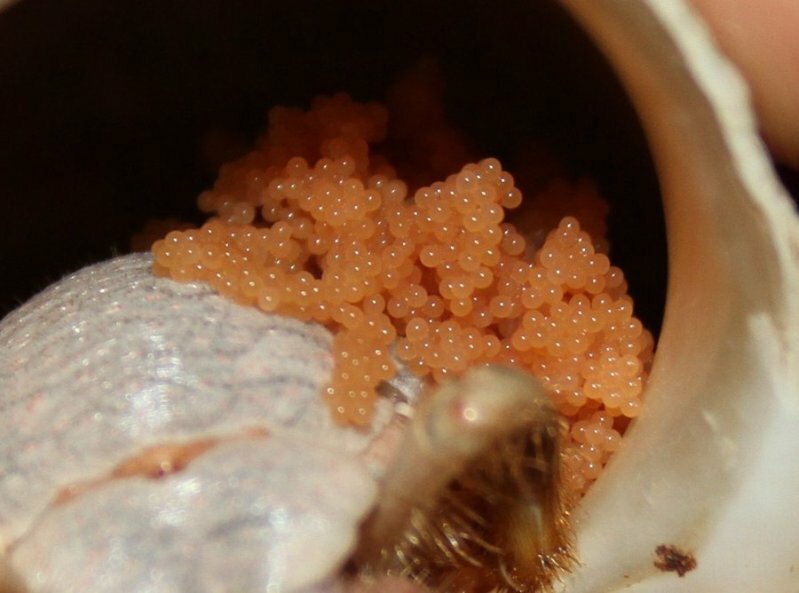 Glaucothoe will start to occupy shells with opening of 1-2mm. 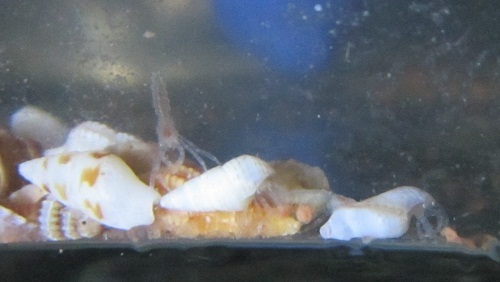 After being in a transition tank anywhere from a few days to a couple weeks, the glaucothoe still living will make their way onto land for their first terrestrial molt. They may come out and go back in a few times before doing this. Photos by Curlz of babies after one year of life. 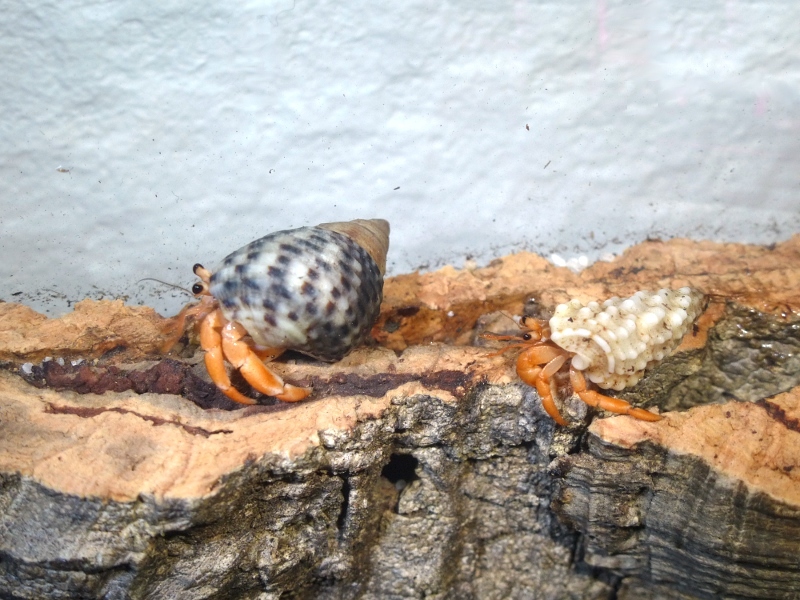 There are several methods to breeding hermit crabs. First thing I want to get out of the way is that there is no way to mark or force them to mate. You just need to have good conditions (heat, humidity, etc), and get lucky. It can happen to anybody. 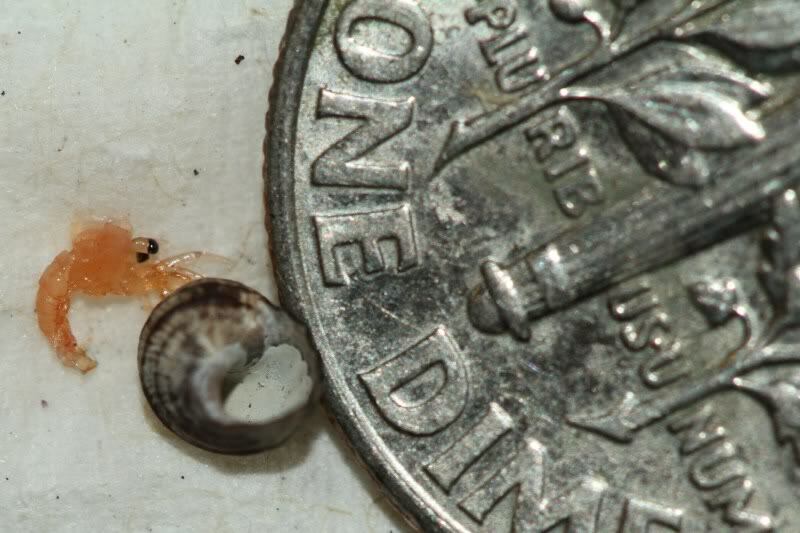 But when it comes to raising the larvae, there are several ways to go about setting up a system to do so. Glaucothoe are placed into a transition tank. 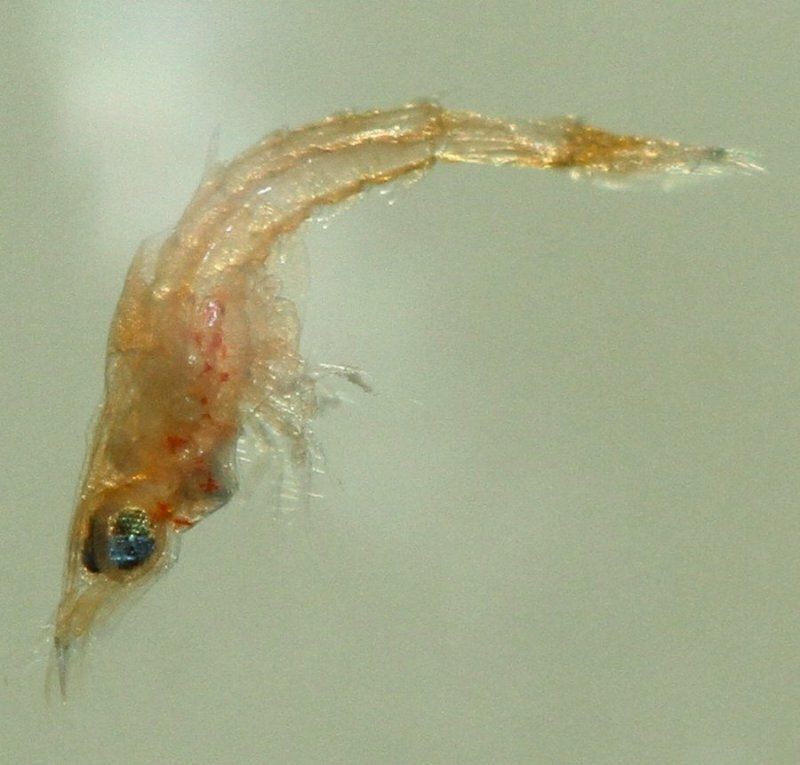 Larvae are reared in many cups, which are kept aerated. 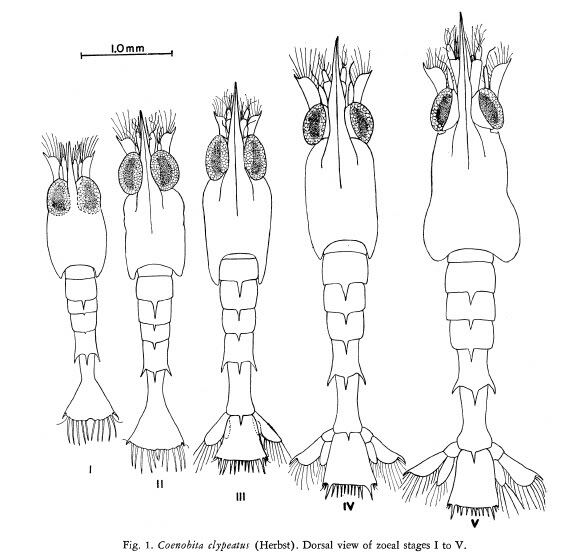 When glaucothoe appear, shells are provided, and the cups are sunk into sand substrate, or the glaucothoe are transferred to a transition tank. This method uses an aquarium of 20 gallons or more, with one large air stone in the middle, and an overhead light. Aquarium heater kept the temperature at 28C/83F. Daily 50% water changes are needed to maintain healthy levels of ammonia. Larvae are attracted to light, so when you need to change the water, you should "herd" them all to one side by sliding the light over, turning off the air stone, and then siphoning water from the other end. You should alternate the cleaning of ends each day. 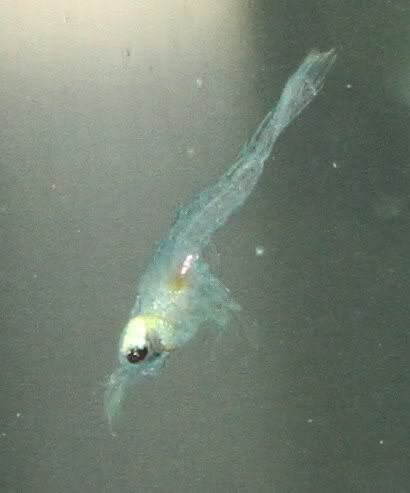 After siphoning, you can scoop out any live larvae from the bucket with a fine mesh fish net and put them back in the tank. Then refill the tank with the siphon using marine water of the same temperature. Our skin is very sensitive to temperature change, so it makes a handy thermometer when trying to get the temperature the same. If it's not perfect, it's ok, but get it as close as you can. You can also combine any one of these methods. It's good to experiment and figure out what works! 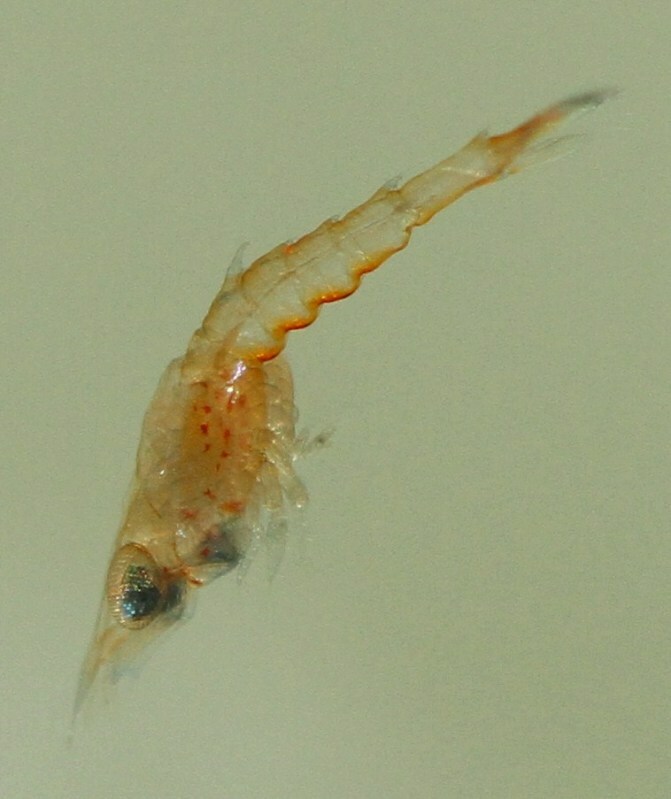 Hatched bring shrimp are good to use for the pre-glaucothoe larval stages. 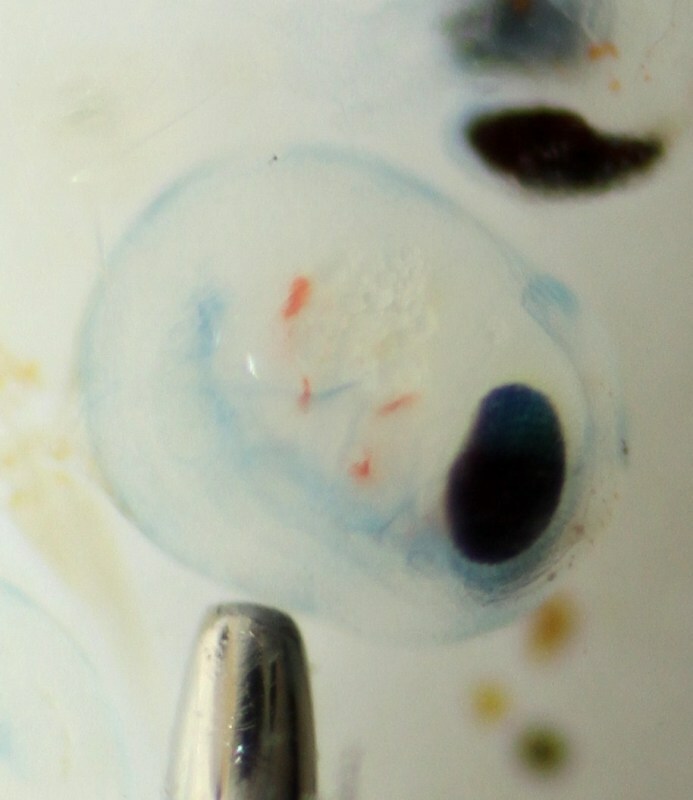 You can create a separate hatchery in a jar, or you can buy decapsulated ones that hatch the instant you add them to the tank. 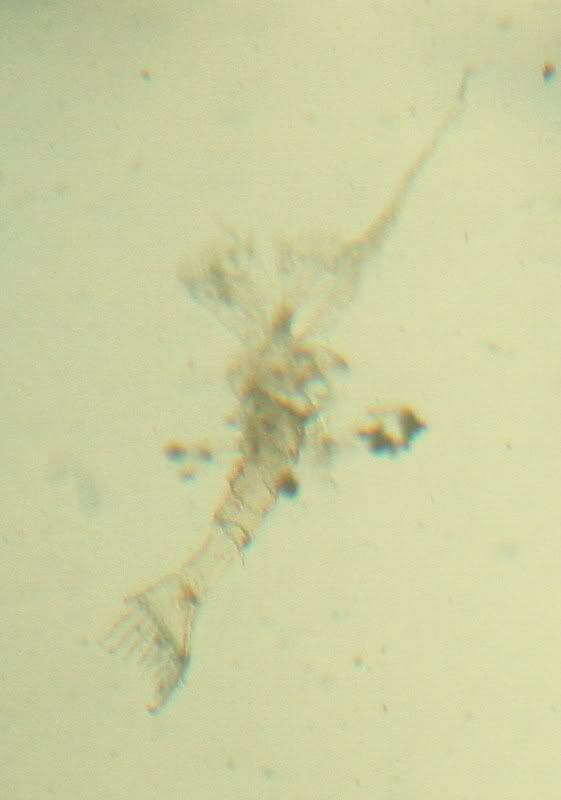 I also supplemented their brine shrimp diet with spirulina. I usually did this right before water changes, and only about once a week because it is very messy and can throw off your ammonia levels. 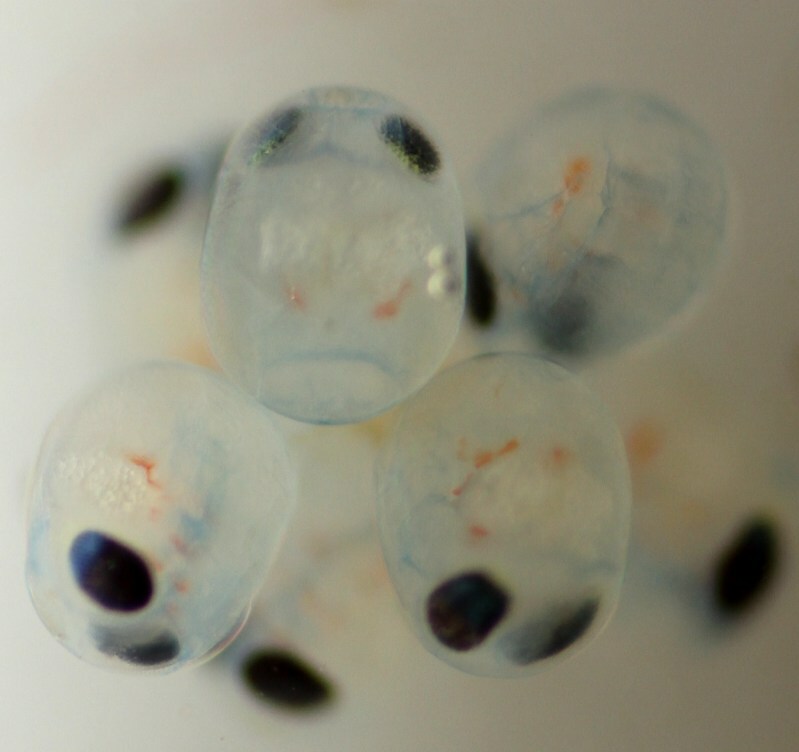 Glaucothoe will eat their siblings, so when they are moved to separate jars or a transition tank, they will need larger food. 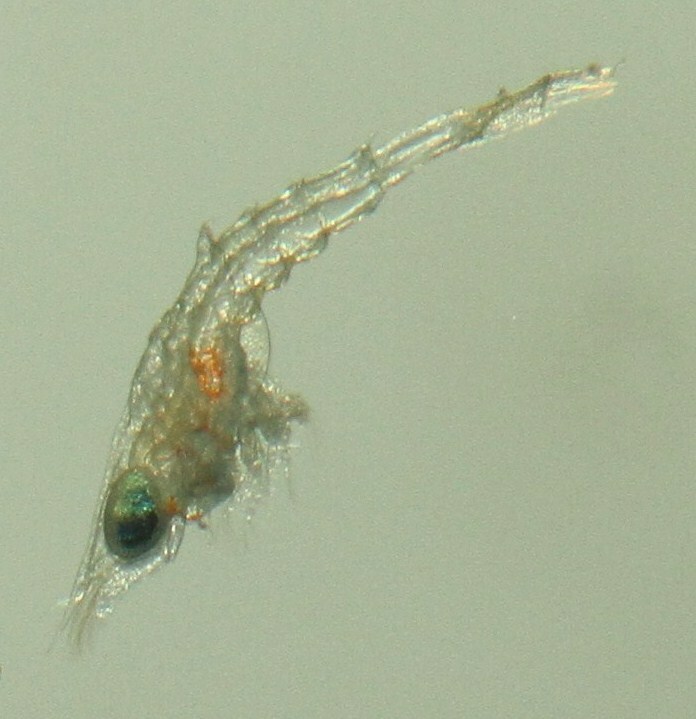 They can eat things like marine copepods (products like PhycoPure). 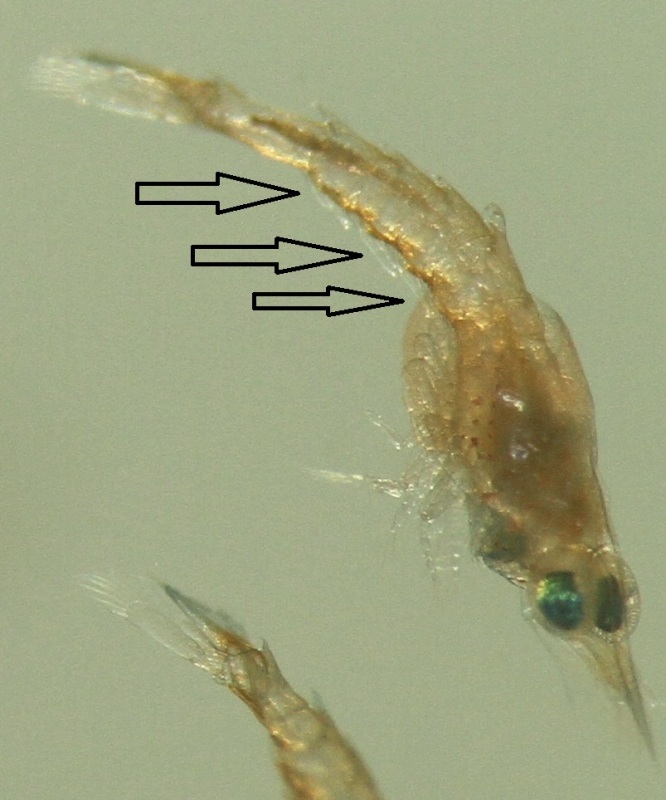 You can also feed frozen or freeze dried high-protein foods as outlines in page 5 of Curlz's breeding document ( https://docs.google.com/file/d/0Bxr0FH0 ... mhQQQ/edit ). 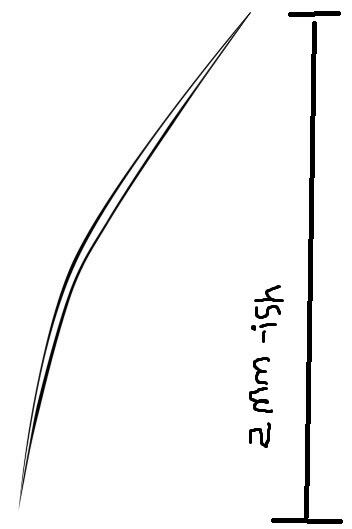 The saltwater in the tank and transition tank should be normal strength marine salt water. It's good to buy in bulk because you will likely need a lot! Any marine salt brand is fine. I used Petco brand because it was cheapest. 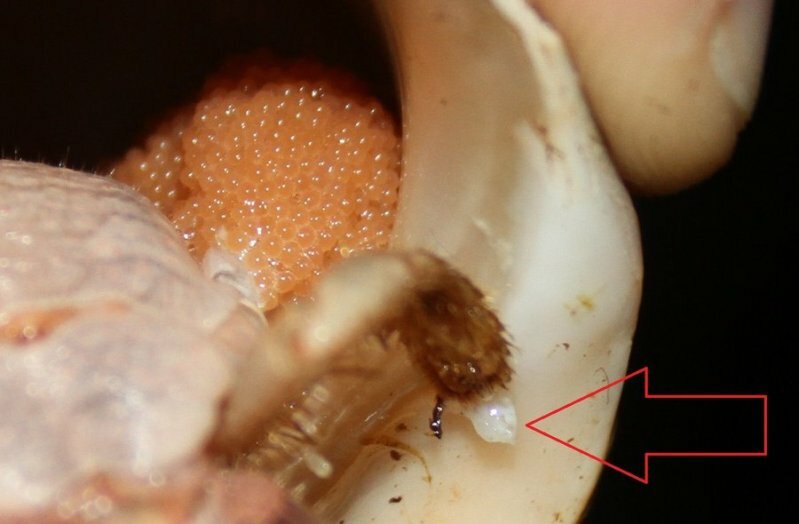 For glaucothoe and new terrestrial hermit crabs, you will need shells of 1-2mm opening. There are several place to get these. -HCA friends! 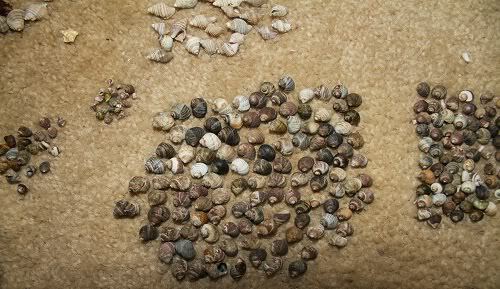 Wolfnipplechips has access to very tiny shells that are shaped exactly like turbo shells. 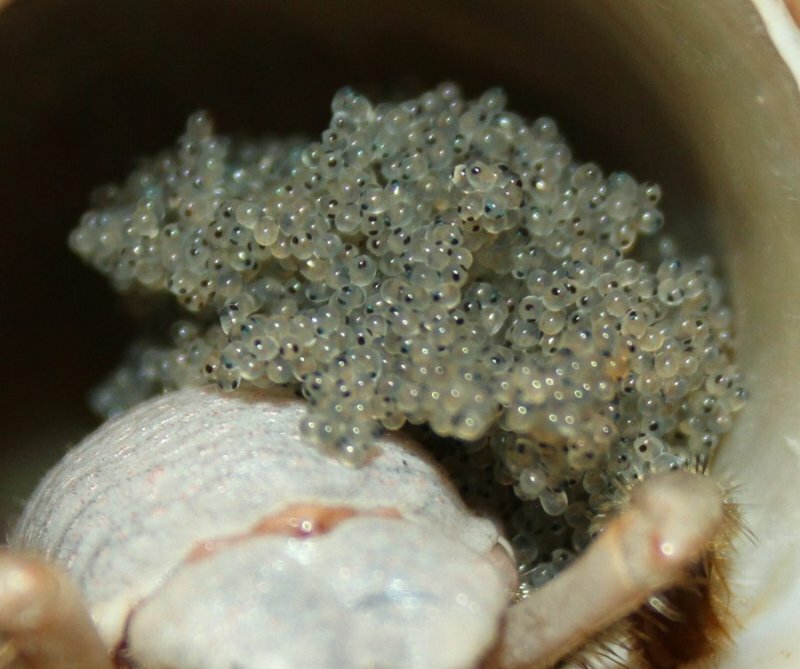 She is always willing to send some if you are rearing crab babies!